Championship Tour number seven takes us to the South Pacific to the island of Tahiti in French Polynesia. The Tahiti Pro is once again held at the picturesque Teahupoo which is located on the south west of the island. The event window is from August 10th through to the 21st. We may see a couple of lay days early on in the event with the swell looking relatively small early on in the contest. It's been over a month since we saw any surfing on the Championship Tour but Vans featured a contest in Huntington Beach, California just over the weekend in which we saw a number of CT surfers enter, maybe perhaps a warm-up to the Teahupoo event. Hometown hero Kanoa Igarashi took out the event, in a close final against rookie Griffin Colapinto. The 20 year old Igarashi is having a fine season, ranked 17 in the tour rankings and hopefully looking to better that with a trip to Teahupoo. Igarashi will come up against local Tahitian Michel Bourez and Hawaiian Keane Asing in heat eight in the first round. Once again the surfing world will miss veteran Kelly Slater who has withdrew from the Tahiti Pro, due to an ongoing foot issue. He will once again be replaced by wildcard Australian Mikey Wright who is currently ranked ninth in Championship Tour race and usually seems to take full advantage of his wildcard spot. Another surprise to the surfing community is John John Florence has also pulled out as well with injury concerns and will be replaced by Brazilian Wiggolly Dantas. After winning the J-Bay event last month Filipe Toledo is now leading the event and is ahead of second position Julian Wilson by over 4000 points but he is far from safe. Toledo has had a horror run at Teahupoo in the past with two round two finishes in the past couple of years and a round five exit in 2015 to fellow countrymen Italy Ferreira when he failed to score a point. Honestly though I can't see him not making the finals this year after the year he has had so far. The same can't be said about Gabriel Medina with the ex world number one winning the event in 2014 then making the final in 2015 and 2017. Medina is a threat to the competition and is now ready to pounce and improve his position in the standings. 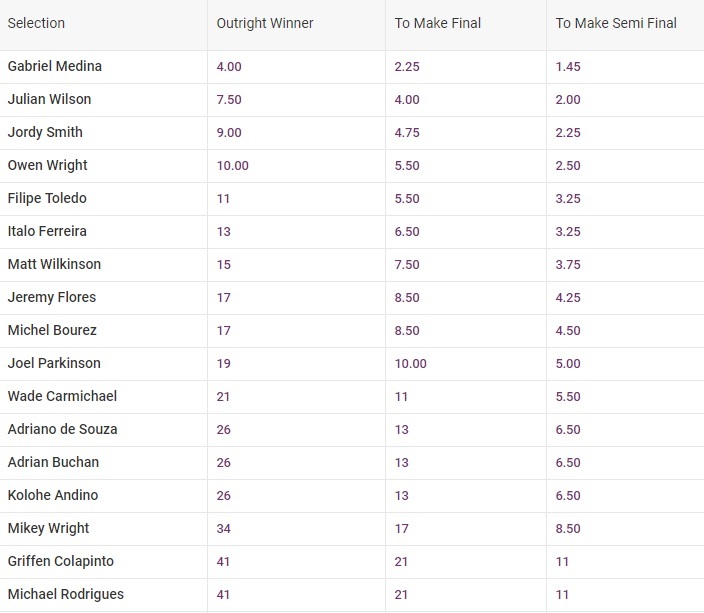 Medina is currently in third position in the rankings but is one of the better barrel riders in the competition, so if Teahupoo brings something special expect to see Median holding lingering around the finals. Last year's event winner Julian Wilson will be trying to get back to back victories after taking out the event last year ahead of Gabriel Medina in one of the best finals we have seen. Wilson was knocked out by Jordy Smith in the quarterfinals in JBay, but he has been consistent all year and has only had two minor slip ups when he hasn't reached the finals. Wilson will match up with Joel Parkinson and local Tahitian Mateia Hiquily in round one. It's hard to pick a winner outside the top three ranked surfers with experience certainly a factor when surfing Teahupoo and I expect Medina to go one better this year.